Remember all those rumors about the 1TB Galaxy S10+? Samsung has essentially confirmed the handset today. It announced the industry’s first 1TB embedded Universal Flash Store chip for smartphones. What that means in simple words is that it can now offer 1TB of internal storage on smartphones. The rumors have claimed that at least one variant of the Galaxy S10+ will have 1TB of internal storage. It may also be coupled with 12GB of RAM but that remains debatable for now. The announcement of this new memory chip now is a strong indication that it may debut with the Galaxy S10+. 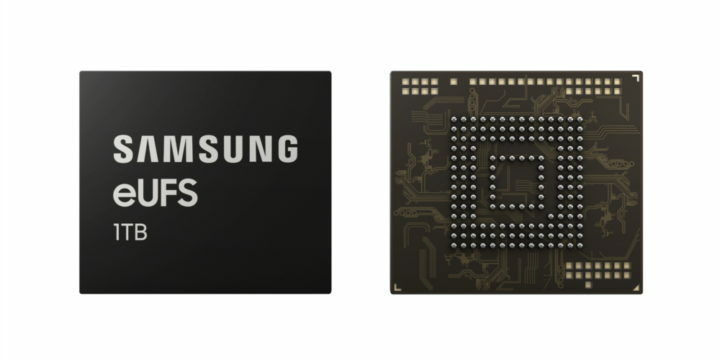 “Samsung is committed to assuring the most reliable supply chain and adequate production quantities to support the timely launches of upcoming flagship smartphones in accelerating growth of the global mobile market,” said Cheol Choi, EVP of Memory Sales & Marketing at Samsung, hinting that this chip will indeed be present on a Galaxy S10+ model. The 1TB eUFS chip has the same package size as the 512GB version launched in 2017. It combines 16 stacked layers of Samsung’s 512-gigabit V-NAND flash memory with a new proprietary controller. This will enable phone users to store 260 10-minute 4K UHD videos. The chip promises speeds of up to 1,000 MB/s which is almost twice the sequential read speed of a conventional 2.5-inch SATA SSD. The random read speed has been increased by 38 percent to 58,000 IOPS compared to the 512GB eUFS. Random writes are now 500 times faster than a normal microSD card at 50,000 IOPs. These high random speeds will allow for high-speed continuous shooting at 960 frames-per-second and allow users to take full advantage of their devices’ multi-camera capabilities. Samsung’s memory division will obviously sell this chip to other companies as well so expect more 1TB smartphones this year. It seems like a done deal now that the Galaxy S10+ will be the first for the year. 1TB with the expensive price tag? No thanks. 16GB is already enough for me. While I do use my phone like a mini laptop, I have no need for much storage. I think laptops do require at least 256GB though. Who cares about Chinese garbage? Samsung cares or at least should care!